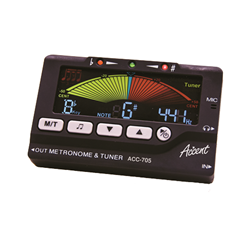 This chromatic tuner/metronome features a full colored display for easy readability. Able to pick up all notes in the range of the piano, this tuner will work for any instrument. The metronome will tap common rhythms from 30bpm up to 250bpm.